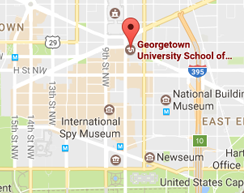 October 21, 2013 – More than 500 furloughed federal employees and contractors enrolled in free courses and seminars at Georgetown University School of Continuing Studies (SCS) during the 16-day federal government shutdown that began Oct 1. The school created a special program in response to the shutdown as part of Georgetown’s commitment to Washington, D.C., and to reach out to the large number of government workers who were unexpectedly out of work. Nineteen courses were offered over a two-week period in subject areas such as project management, leadership development, health care and social media. All courses were offered through SCS’s Center for Continuing and Professional Education at its new downtown campus location. The employees were eligible to take one free course each after applying and being accepted into the course. Furloughed employees who took part in one of SCS’s professional development courses or seminars represented a broad spectrum of government workers and contractors from across the D.C. community. Furloughed employees who took part in the courses represented a broad spectrum of government workers and contractors, including those working for the U.S. Department of Agriculture, the F.B.I., the Department of Labor, the U.S. Senate and House of Representatives, the Department of Health and Human Services and the National Parks Service. Most of the courses were designed to appeal to government workers so that they would be inspired to take what they learned in classrooms and apply it to their workplaces. The course Ready, Set, Reset Your Social Strategy challenged students, many of whom work as public affairs professionals, to boost their social media savvy through hands-on workshops. “What we really focused on was empowering students to use essential social media tools and strategies that would enable them to advance their professional work,” said Tiphané Turpin, visiting assistant professor in SCS’s Master’s in Public Relations and Corporate Communications program. Turpin co-designed and taught the social media course, which was one of the most popular offerings, with Julie Dixon, deputy director of SCS’s Center for Social Impact Communication and adjunct instructor in the public relations program. "The course was a great way to spend an afternoon during this 'break.' I look forward to sharing what I learned with my co-workers when the government reopens," said Jennifer Kaplan, a student in the social media course and deputy assistant director in the Environmental Protection Agency. High demand for the courses exceeded expectations. Initially, six courses were offered with 100 seats, which filled up immediately. The school added an additional 13 courses and hundreds more seats. In total, more than 1,000 applications and inquiries were processed over the two-week period. Students took courses in a variety of subjects, including Innovation and Leadership in Government, Project Management Fundamentals and Manager as Coach, to gain new knowledge or learn new skills. Kim Skrtic, a health services expert at the Peace Corps, enrolled in the project management course. While the government reopened on Thurs., Oct. 17, many students chose to finish their multi-day courses.